“What if you could live again and again, until you got it right?” Amazon’s tagline for Life After Life worked its magic, and I instantly bought the book. I’ve been fascinated by the concept of reincarnation since Catholic School told me that I shouldn’t be, but Life After Life wasn’t quite what I had envisioned. Ursula Todd is born again and again and again. It is always in 1910. It is always to the same set of parents and in the same circumstances. The duration and details of each life vary here and there, but most of the core components remain unchanged. Sometimes she is married, sometimes she dies in childhood, sometimes she is an alcoholic. But every time she dies, she is born amidst a blizzard in 1910 to Hugh and Sylvie Todd. Apparently, the gist is that Ursula should somehow recognize the fact that she has lived previously (which, on some level, she does), and use this knowledge to impact the future. How, you may ask? Well, she’s supposed to cozy up with the Fuhrer and…well, I don’t really know what she’s supposed to do. I don’t think she does either, but I guess once she figures out how to become Hitler’s bestie, then she can worry about how to take him out. 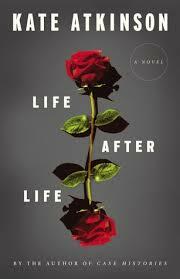 Life After Life is a brilliant retelling of one of the most deeply poignant films to ever exist. That film, of course, is 1993’s Groundhog Day. Phil is forced to relive Groundhog Day indefinitely, until he learns how to embrace life and find love. Similarly, Ursula cannot move on from her existence until she learns to embrace life and shoot Hitler in the face. Atkinson’s novel would have undoubtedly benefited from some sort of rodent sidekick. In all actuality, Groundhog Day is the superior of these parallel tales. Although the Bill Murray classic spans only one day on repeat, it actually manages to be less redundant than Life After Life. I struggled through at least four of Ursula’s lives to even grasp what Atkinson was doing – it initially just seems as if everyone thought Ursula had died, but she really hadn’t. Once this kept happening, it became apparent that this awkward gimmick was intended to convey reincarnation. So, Ursula is born, we are blandly informed on the trivialities of the Todd family, Ursula lives briefly (or not so briefly), and dies. And then she is reborn, and we are again bombarded with the mundane details of Todd family existence. To top that off, the end of the novel provides no sense of resolution. At least we know that Phil makes it to the day after Groundhog Day, AND he got the girl, so they can bask together in the glory of their groundhog-inspired love. But Ursula seems to have gained nothing from her infinite existences, only varying methods of suffering. She never makes it on to another life, and by the end we don’t know if this time around will be the last. Who knows? Maybe the next time she is reborn, it will be as Bill Murray.